Additional amenities in these North Myrtle Beach rentals include a washing machine and clothes dryer. There is high-speed Internet access that you might want to take advantage of during your North Myrtle Beach vacation. There are numerous televisions and more than one DVD player in these North Myrtle Beach rentals, too. Ceiling fans keep the air moving in these non-smoking vacation units though the balcony offers a convenient way to get a breath of fresh air without leaving the comfort or privacy of these North Myrtle Beach rentals. Whether you are an early bird who likes waking up early to see an oceanfront sunrise or a night owl who better appreciates a star-filled sky accented by the moonlight, a beachfront balcony in your North Myrtle Beach rental is the ideal. 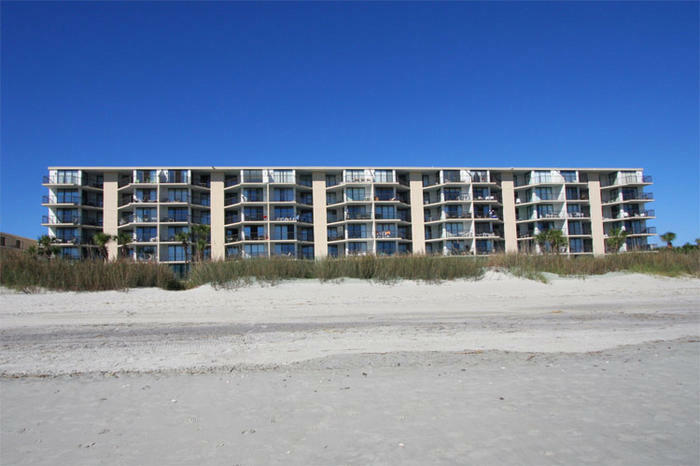 From the oceanfront balcony of your North Myrtle Beach vacation condominium you can see the sandy dunes that are filled with sea oats. Listen to the sea oats rustle in the soft breezes and watch the tide roll in and out as you gaze seaward. The sound of the waves crashing on the beach is soothing and rhythmic. But don’t spend all of your free time on the balcony. Go down to the white sandy beaches and feel the sand on your bare toes and let it run out of your fingers. Hunt for sharks’ teeth and seashells to take home with you as marvelous souvenirs of your North Myrtle Beach vacation. Have the camera ready because dolphins swim down the coastline and you will want to get a picture of that peaceful scene. Down the beach from Crescent Sands is a very popular fishing pier. The Cherry Grove Fishing Pier is the site of many award-winning catches. The long pier is a favorite among visitors and locals alike. You don’t have to bring your own fishing gear to fish the Myrtle Beach area’s piers. You can rent rods and reels for the day. Charter a deep-sea fishing boat and go to the Gulf Stream for some real sport fishing. Head boats are available to take a large number of people just offshore and just about guarantee that you will come home with a fresh catch. Rent a jon boat and cruise the salt marsh on your own or hire a guide for some inlet flounder fishing. There are a handful of live entertainment theatres around the North Myrtle Beach area. They offer a variety of shows that are family-friendly. At Barefoot Landing you will find House of Blues with an ever changing concert schedule. Also at Barefoot Landing is the Alabama Theatre where a resident show lights up the stage nightly. The Carolina Opry is easy to find on Highway 17 and it is right next door to Pirates Voyage, a new dinner theatre with swashbuckling pirates that perform near a lagoon. Medieval Times is another dinner theatre and Legends in Concert is a tribute theatre that brings to the stage some of the best musicians of all time. The Palace Theatre is a venue near Broadway at the Beach that features traveling productions that range from concerts to Broadway shows. If it is seafood you like it is seafood you can have during your North Myrtle Beach vacation at Crescent Sands. This North Myrtle Beach resort is surrounded by delicious restaurants. Your dining options are seemingly never-ending. There are a number of seafood buffets in Restaurant Row. You can find raw bars that sell seafood by the pound and restaurants with oyster roasts. There are also seafood markets all over the North Myrtle Beach area so you can pick your own fresh seafood and prepare it in the privacy of your North Myrtle Beach vacation rental at Crescent Sands.